“Son Op” fades quickly but gracefully in, announcing itself with two measures of slowly building layers of accordion, then thrusting a righteously bulbous rhythm section onto you without asking if you’re ready to begin. The fact that it grows from there is miraculous, never fading, unconcerned with a bridge, thinking only of your feet and whether they are moving, your heart and whether it is racing. “Son Op” is not the best of South Africa’s long-living, long-suffering, long-joyful Boyoyo Boys, but it’s perhaps the most bluntly indicative of their early magic. This would be the same magic that Paul Simon, at a crossroads in his personal and professional life, fell under the spell of when a friend sent him a compilation tape of contemporary South African tunes. Simon has been both open about the story of how his fascination with the music that would form the bones of his culturally dominating Graceland began, and dodgy about the specific artists he stepped over to get there. You could replace his name and the title of his album in that previous sentence with the name and masterwork of dozens of (some might say all) white American musicians, and the song would sound the same. When Paul Simon heard the Boyoyo Boys for the first time, he heard inspiration and hungered to join the tradition. Where you place your opinion of this on the spectrum between honorable and slimy surely dictates your feelings about Graceland. And look back, to only half a decade before. Before Graceland, there was 1980’s Remain in Light, David Byrne’s masterpiece with Talking Heads that felt both blindingly new and suddenly like the natural apex of the songwriter’s rocketing career up to that point. It, too, strips rhythms from the traditions of west and south African communities to tell its stories of midlife ennui. Brian Eno’s production situates the songs on Remain in Light in the electro-experimental era from which it spawned (and would go on to spawn even more radically), but the influences are right there. And this is why Angélique Kidjo’s 2018 full-album cover of Remain in Light still feels so essential as the year comes to a close. Kidjo is not a household name in the United States, but this says far more about the United States than it does about her. An immediate and massive star since the release of her debut record Pretty in 1981, Kidjo was the first woman to be named one of Forbes’s “40 Most Powerful Celebrities in Africa,” was listed on The Guardian’s “top 100 most inspiring women in the world,” holds honorary degrees from Yale and Berklee College of Music, and is currently serving as the Harvard Jazz Master of Residence. She has three Grammys and thirteen albums to her name. And this is all extremely surface-level research; Angélique Kidjo (born Angélique Kpasseloko Hinto Hounsinou Kandjo Manta Zogbin Kidjo) is only one of a thousand bright examples of the Great American Blindspot. Kidjo was born and raised in the west African coastal nation of Benin, sandwiched slimly between Togo and Nigeria, and has said about her version of Remain in Light: “As [this record] was influenced by the music of my continent, I want to pay back the homage and create my own African take on Talking Heads’ songs.” This is very diplomatic, indicative only of the thrilling joy that often infects her music—in the same promotional statement, she also said “We all know that rock music came from the blues and thus from Africa. Now is the time to bring rock back to Africa, connect our minds, and bring all our sounds to a new level of sharing and understanding.” “Now is the time” is such an interesting expression here, because it isn’t clear why now, and why not always or anytime. I guess now is the time because now has always been the time, whenever now has been. Kidjo’s interpretation of Remain of Light is bombastic around every corner, a reinterpretation that feels simultaneously full of genuine brightness and a biting, necessary irony. “Once in a Lifetime,” stuck right in the middle as it was on the Talking Heads’ original listing, is the most vivacious standout—Kidjo relishes in Byrne’s lyrics, turning his half-shout into a full one, his murmured chorus into a ripping statement of intent. It’s a six minute tour of Beninese rhythms, controlled where it needs to be and let loose just about everywhere else; look, the artist is saying, let me show you what you missed. Take a look at these hands. Take them. Come. 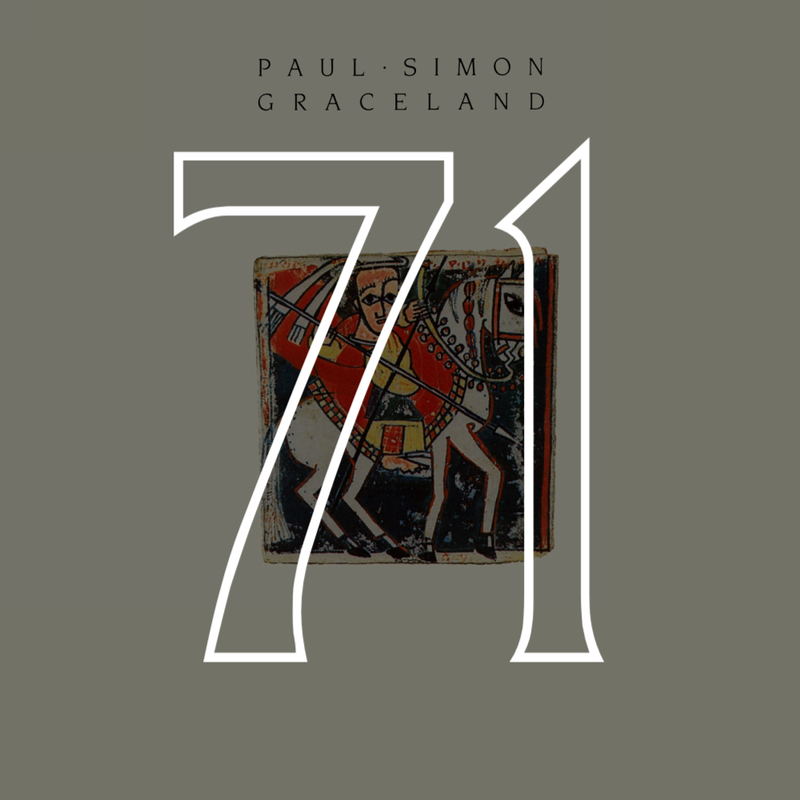 Like Remain in Light, Graceland is tough to grapple with because it’s both sides that make it magic—Paul Simon’s ever-young voice, almost pastel in its cunning calmness, and the unrelenting Soweto sound, so exciting to the ear, so absolutely bursting with vibrant urgency. It’s Simon’s lyrics about New York romance and divorce in the heartland of America and hitting middle age gracelessly and terrified, all of it layered thrillingly over music unintended for its jacketing. It’s tough because the record is so good—the songs simply bulletproof, track by track by track—but by many accounts, its production is an ugly quagmire of sonic theft, misattribution, and painfully familiar white (American, male) privilege. Twenty-five years after its initial release, the deluxe remaster worked to give credit more appropriately, with songs sporting new features by Ladysmith and Los Lobos, of course, but also the Boyoyo Boys, Good Rockin’ Doopsie, the Twisters, the Gaza Sisters, and General M.D. Shirinda. The thing is that Graceland will never be perfect—there’s too much shady damage done, too much bitterness through the years, too many question marks that don’t pass muster—but the roots of rhythm remain, and they are glorious, as close to perfection as one could achieve through 11 songs and the unfortunate production techniques of the upside-down 1980s. When you watch footage of Paul Simon winning the Grammy for Album of the Year for Graceland, you’re watching a relic from a stranger time. Whoopi Goldberg and Don Johnson present the award in matching suits and when she announces his name from the envelope, Whoopi jumps up and down in unbridled excitement. The audience delivers Paul a standing ovation. The stage decoration feels ripped from Keith Haring’s stepbrother’s rough draft notebook. In his acceptance speech, Paul is gracious and seems more humbled than you might expect, almost embarrassed even, and at the speech’s end he does name some of the South African musicians who worked on the record. But it isn’t only these musicians who we must remember to remember, is it? It’s the roots, the snatched rhythms, of colonization. I don’t know that there is a correct way to enjoy Graceland in 2019, but I enjoy it immensely, and I am grateful for its songwriting and for the craft of its musicians. I am grateful for the musical rabbit holes it sends me down. I am grateful to begin with this record, to honor it for the beauty it holds, and to pull on its loose threads until the whole thing unravels.